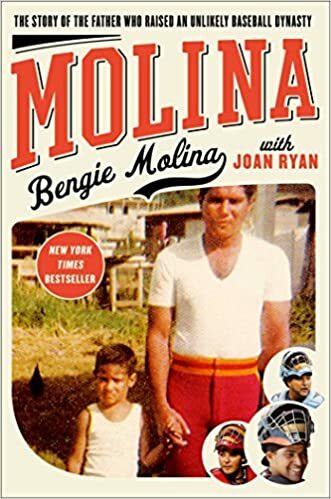 Molina: The Story of the Father Who Raised an Unlikely Baseball Dynasty by Bengie Molina with Joan Ryan (Simon and Schuster, 2015), 255 pages. An autobiography of Bengie Molina, the oldest son of Pai and Mai. Their home was a small town in Puerto Rico. The family produced three sons (Bengie, Jose, and Yadier) who were major league catchers who each won two World Series championships. The book honors his father, Pai, for coaching them to learn the game, and his mother, Mai, who managed the home. Pai was a talented baseball player and an effective trainer of ball players. He taught one skill at a time. He taught respect for everyone involved in the game. He never became a major league player and near the end of the book Benji reveals the reason. I was disappointed Pai practiced and taught his boys that baseball was his religion. I also found it disappointing that Benji began a relationship with another woman while he was still married. I enjoyed the many stories about the Molina family and baseball. I have followed Yadier Molina and the St. Louis Cardinals since 2004. While the book has little about Yadier, I was glad to learn about the Molina family and the culture of their community.